Sandy Leon has two-run single in eighth inning to put Boston ahead for good. DETROIT (AP) — Even if the Boston Red Sox hadn’t been short-handed, this would have been a gratifying win. 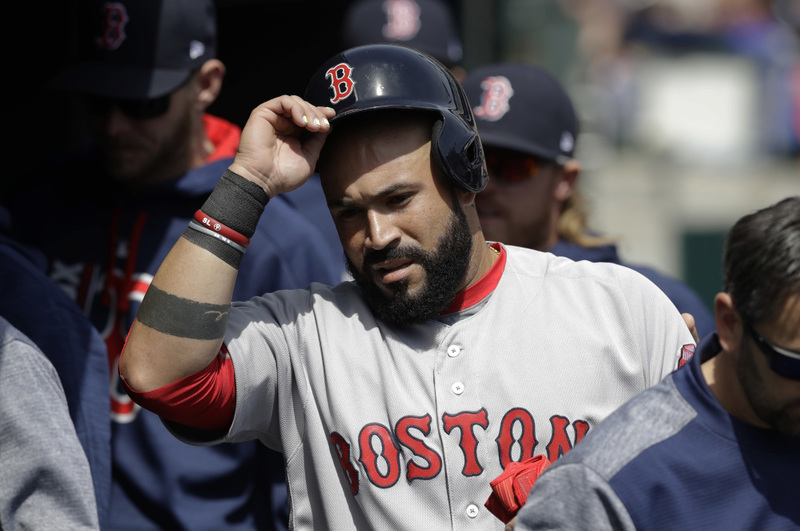 Sandy Leon broke an eighth-inning tie with a two-run single, part of a four-run rally that lifted Boston to a 7-5 victory over the Detroit Tigers on Sunday. The Red Sox, depleted recently by injury and illness, rallied four times from one-run deficits. Jackie Bradley Jr. missed the game for Boston after hurting his right knee Saturday, but the Red Sox got Mookie Betts back after he’d been out sick. Hanley Ramirez was still out with an illness. Xander Bogaerts hasn’t played since Wednesday — he’s been on the bereavement list. The Tigers led 4-3 in the eighth when Bruce Rondon (0-1) allowed a leadoff walk to Betts and a single by Chris Young. A throwing error on Young’s single by left fielder Justin Upton left runners at second and third. After an intentional walk, Kyle Ryan came in and walked pinch-hitter Brock Holt to force in the tying run. Leon followed with a line drive to center , and Boston led 6-4. Matt Barnes (1-0) got the win in relief for Boston. He’d just come off the bereavement list before the game. Craig Kimbrel allowed a run in the ninth but recovered for his second save of the season. He’s converted 21 chances in a row. The Red Sox led 7-4 when Kimbrel walked the first two Detroit hitters in the ninth. The Boston closer then struck out Miguel Cabrera. Victor Martinez nearly tied it with a drive to right, but it went foul, and he ended up settling for an RBI single. Kimbrel then struck out Upton and Tyler Collins to end it. Boston right-hander Rick Porcello allowed four runs — three earned — and 11 hits in six-plus innings against his former team. Last year’s AL Cy Young Award winner walked one and struck out eight. Porcello looked briefly hobbled at one point when he brushed against Detroit third base coach Dave Clark while going to back up the base. Porcello reached 1,000 strikeouts when he fanned Martinez in the first. Upton put the Tigers up 1-0 with an RBI single in the first. After Marco Hernandez tied it with a run-scoring single in the second, Ian Kinsler drove in a run with a single in the bottom of the inning. Mitch Moreland hit an RBI double in the third for the Red Sox, but Detroit took a 3-2 lead on Kinsler’s run-scoring single in the fourth. The Red Sox tied it again in the seventh on an RBI single by Andrew Benintendi. Nicholas Castellanos put the Tigers up 4-3 with a homer in the seventh, but that lead — like all their others — was short-lived. Daniel Norris allowed three runs and seven hits in 6 1/3 innings for Detroit. The Red Sox appeared to have hit into a double play in the seventh, but a call at second base was overturned after a replay review. It turned out Kinsler had come off the bag an instant before making the catch-and-throw to first. That reversal gave Boston a runner on second with two outs, and Benintendi’s hit tied the game at 3. Red Sox: Before the game, Farrell said Bradley was dealing with some soreness and swelling in his knee. Bradley said afterward he’s hopeful he can avoid the DL, but he was set to return to Boston for further evaluation. Red Sox: Chris Sale goes Monday in the series finale. Sale pitched seven scoreless innings against Pittsburgh in his previous start this season. Tigers: Justin Verlander (1-0) takes the mound for the first time since Detroit’s season opener. He is 5-5 with a 2.96 ERA against Boston in his career.